The last Mastercastle release I heard was Dangerous Diamonds, but their formula remains pretty much exactly the same on their newest, Enfer (De la Bibliothèque Nationale). The duo of founding shredder Pier Gonella and singer Giorgia Gueglio remain a guilty pleasure for me due to the poppy nature of their music, but there's definitely some pleasure to be had there, since much like their previous albums, Enfer has a few excellent songs mixed in with other rather paint-by-numbers ones. The Castle starts off with the sort of melody that immediately calls to mind Mastercastle: Mid-tempo, with choppy effects that sound a bit like they come from keyboard, but are, I think, from Gonella's guitar. The bass and drum kit don't get a lot of room to do much other than back the guitar work, and might as well be synthesizers for all the room the production gives them; but the guitars, of course, are superb, a combination of traditional power metal shredding and jazz-like fugue solos that flutter across the songs every chance they get. Gueglio's voice is overly sharp, even when she tries to tone it down -- she really only has one volume and tone setting and Let Me Out's chorus suffers from it -- but every time the song lets her voice crank up to that loud setting, she nails it. 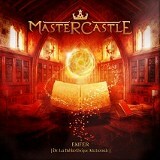 Like almost all of Mastercastle's songs, Naked and Pirates favor a steady but rather boring mid-tempo rhythm with little going on in them outside of the guitar to give Gonella and Gueglio the most space to do their thing, and though the verses are usually pretty hard to see much value in, the chorus melodies are where the strength of the songwriting gets focused. The title track has a more melodic and sentimental sound to it, some synthesizers and a softer overdrive used on the guitar, with Gueglio making more than the usual effort to make her voice a little softer -- or so it seemed to me. All that effort at being softer doesn't succeed much, though. Both the guitar and vocals are technically excellent but are so sharp, hard, and unvaried that after an extended period of time the listener might start to get a headache. What's more, some songs don't seem to have much point in their existence, such as Straight to the Bone, the longest and least interesting track on the album, or Behind the Veil, a slow ballad with a melody that doesn't go anywhere, which was a bullet they often dodged in ballads from previous albums such as Jade Star. Venice goes far towards redeeming this losing streak, with a higher speed, more varied verse, and a return to the kind of melodic chorus that the band tends to be good at. Mastercastle has released better albums, but fans are unlikely to be disappointed by this, and I continue to appreciate Giorgia Gueglio's voice (as long as it's in bite-sized portions) when listening to Enfer. This is a somewhat unique female-fronted power metal band in its combination of heavy-duty shredding with matching female vocals, and its latest still deserves a listen or two.